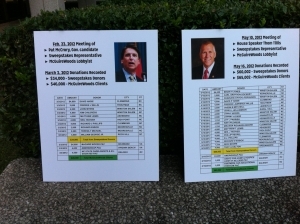 The good government watchdog group Democracy North Carolina called today on government prosecutors to investigate the connections between the controversial “sweepstakes” industry, its lobbyists and Governor McCrory, Senate President Pro Tem Phil Berger and U.S. Senator Thom Tillis. 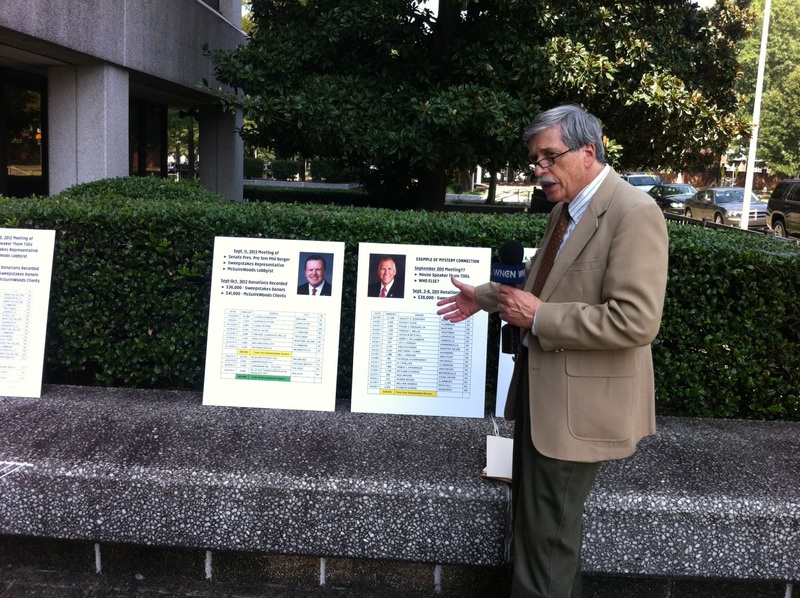 According to the letter delivered to U.S. Attorney Thomas Walker and Wake County District Attorney Lorrin Freeman by Democracy NC Executive Director Bob Hall, the connections raise the specter of political corruption, illegal “bundling” of campaign contributions, money laundering, illegal corporate campaign donations and abuse office. 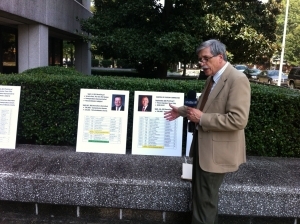 “After two years, the State Board of Elections voted on July 15, 2015, not to find or pursue any violations related to North Carolina’s campaign finance statutes. However, a number of findings in the report prepared by the staff reinforce my concern about illegal acts. 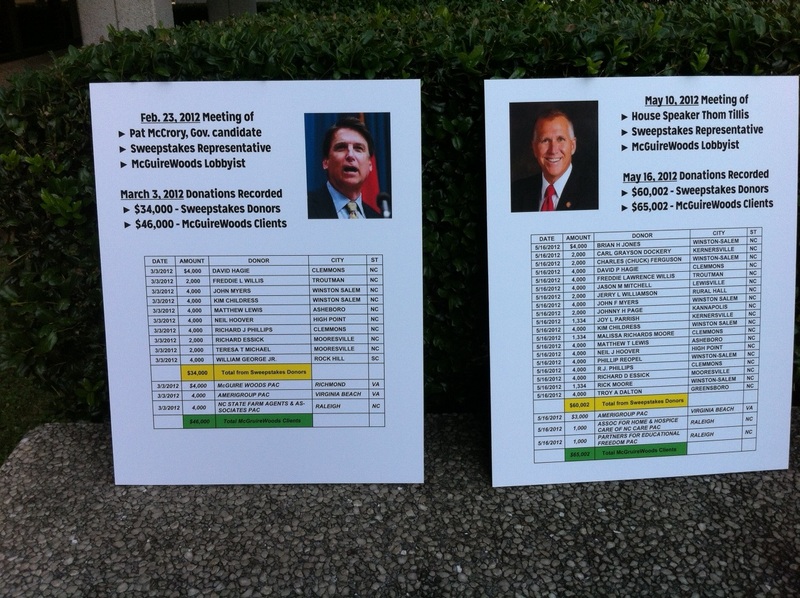 Trust the top campaign donor to NC candidates in the 2012 election cycle (pages 9-15 of the SBE report). The contributions written from the Chase Burns Trust roughly follow the recommendations in a memo titled “IIT Political Contribution Strategy” that was prepared by lobbyists at Moore & Van Allen, the firm retained not by Burns personally but by his sweepstakes’ corporation, IIT (Exhibit 2 of the SBE report). find a similar link to donations in the NC arrangement (pages 32 of the SBE report). Gardner Payne, a major sweepstakes operator, “talked about raising money from the sweepstakes industry for Governor McCrory” during a meeting where the two men discussed ways to legalize the sweepstakes industry (pages 32 of the SBE report). The same representative (Gardner Payne) met separately with then-Speaker Thom Tillis and Senate President Pro Tem Phil Berger about legislation to legalize the industry, and he said he raised campaign funds for them (pages 35-37 of the SBE report). that his law firm was paid more than one million dollars by Burns’ company, IIT. However, Foley continued to push staff for confidential information about who they were interviewing and other details (Attachments C, D, and E of the SBE report). Hall and Democracy North Carolina, of course, came to national prominence back in the mid-2000’s when the group helped bring to light the corruption of former Democratic House Speaker Jim Black. For more information on the Board of Elections and the resignation of member Paul Foley who was at the center of the sweepstakes mess, click here, here, and here.